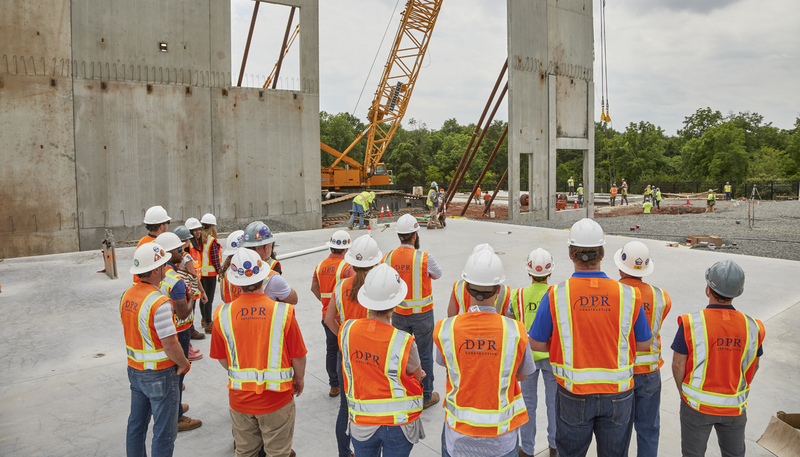 Consistently ranked as a premier builder of mission critical facilities, DPR Construction provides diligent, hands-on management—from site selection and analysis to single point-of-failure identification to construction, startup and commissioning. In Ashburn, Virginia, Digital Realty’s (DLR) latest data center is rising from the ground up with tilt-up wall panels. Scheduled for completion in December 2018, the 230,000-sq.-ft. hyperscale data center is leveraging the cost and time savings of using tilt-up construction, a method in which large slabs of concrete are poured directly at the jobsite, then raised into position to form the building’s exterior walls. Speed-to-market is a critical factor for DLR, as the need for data centers designed to deliver services and content to support the world’s largest cloud platforms continues to grow. With its customer’s needs in mind, the team chose tilt-up panels to eliminate the traditional limits of the size of panels that could be transported to the site. Since larger panels were poured onsite, less panels were needed to complete the structure, further speeding up the process. The tilt-up panels also allowed for early scope release of certain trades, specifically the plumbing and structural steel subcontractors, who installed plumbing risers and steel connections before the tilt-up panels were lifted, saving time down the road. 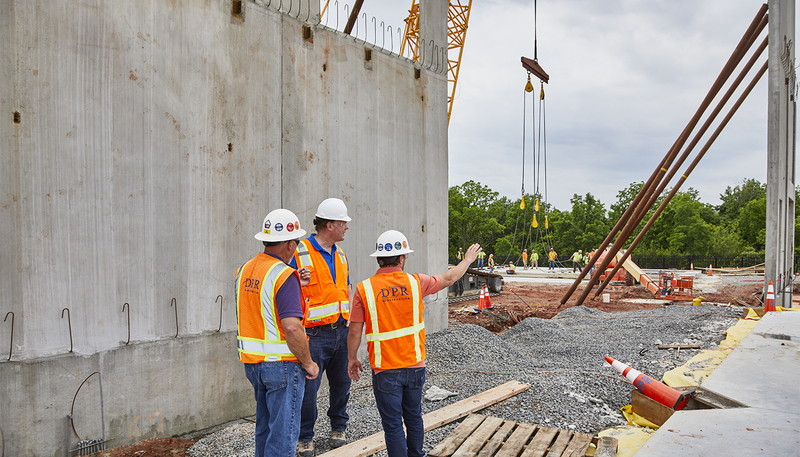 After pouring concrete walls around the building’s perimeter, the team began lifting the walls into place this summer. The process takes approximately 45 minutes per two-story panel, with the team installing between eight to ten panels per day. It will take 105 panels and 2,000 cubic yards of concrete to complete the perimeter of the data center. Once complete, the data center will also include the build-out of a 6MW data center hall and will ultimately host 36MW of power. At the Hana Financial Group Data Center in Cheongna International City, South Korea, a DPR team participated in a traditional Korean gosa ceremony, marking new beginnings, hope and good luck. The first building in South Korea to be built through preconstruction and a GMP contract, the seven-story, 325,000-sq.-ft. data center and 18-story, 342,000-sq.-ft. administration building will rival both domestic and international facilities, and is a significant milestone for DPR’s Korea practice. Providing guidance and leveraging our network in a construction management role, the DPR team helped Hana Bank choose an Uninterruptible Power Supply (UPS) system, the first one that has ever been installed globally. The diesel-driven rotary UPS in an isolated parallel (IP) configuration is backed up by batteries and makes sure the data center’s servers are always running with no glitches or loss of power. With expertise in the mission critical market, DPR helped the client and design team select this system, balancing the owner’s business requirements with optimizing the combination of redundancy, resilience, maintainability and cost. The data center project has overcome challenges including troublesome soil condition as well as a local labor force that is unfamiliar with the mechanical and electrical systems used by global data centers. Led by Sangwoo Cho, who grew up in Korea, the in-country DPR team has remained continuously flexible to adapt to and integrate with the local culture, language and way of approaching situations. It’s a compromise of both sides adjusting to each other and finding a balance of what they are willing to change, while holding on to their respective values. “We understand how the locals do things here, and we have learned how to implement new techniques and strategies that can succeed within the current system in Korea. We are integrating into the local market,” said Hock Yap, DPR’s team leader on the Hana Data Center project. DPR entered the Korean market in 2011, and has since collaborated with several large Korean general contractors, construction management firms and owners on the advancement and adoption of new technologies and ways to manage and deliver projects, including the Hana Financial Group campus, Gyeongsang National University Hospital and Parnas Tower. “In a sense, we are a breath of fresh air in Korea because we do things so progressively, with a focus on innovative technology. Whether it’s installing the first ever UPS system, collaborating on preconstruction, or introducing a new type of contract, sometimes our clients are in disbelief that we can actually do these things, but our achievements are real and can be backed up with data, facts and case studies,” said Yap. Yap was one of the DPR team members who participated in the gosa ceremony, placing a symbolic envelope of money into the mouth of a pig’s head, as well as a dried pollock fish on the first server rack installed. Embracing the culture of Korea, the team is looking forward to building great things with hope and good fortune for decades to come. Two of DPR’s core market experts took the stage this winter at Bisnow’s Annual Data Center Investment Expo in Dallas, where industry leaders from across the country gathered to discuss the latest trends and innovations in data centers and industrial buildings. Among the group of speakers and panelists were DPR’s Mark Thompson, national advanced technology market group leader and Andy Andres, a project executive in DPR’s Dallas office. Throughout Thompson’s role as moderator of one of the panels, several topics about site selection were debated, including successful factors to hyperscale projects, and the process of locating strong regions and sites. The key to a hyperscale project’s success is speed-to-market and partnerships, due to rapid growth and extensive project scopes. After the strategy behind the business direction is decided, regions are then considered and based around demand. The two pivotal factors following site selection include core fundamentals of infrastructure (water, sewer, power, fiber), and connectivity to populated areas for access to labor. The use of laser scanning and drones, which help transform facilities into more adaptable and flexible spaces, ultimately reducing uncertainty during the construction process. The creation of a collaborative work environment with real-time project management tools to continuously reaffirm what the customer wants to build and how they want to build it. The importance of technical platforms to integrate virtual designs in design-assist and build-out. Industrial buildings and data centers have been equipped with more features in recent years and are continuing to evolve. Data centers are transforming to denser builds with more power and cooling. 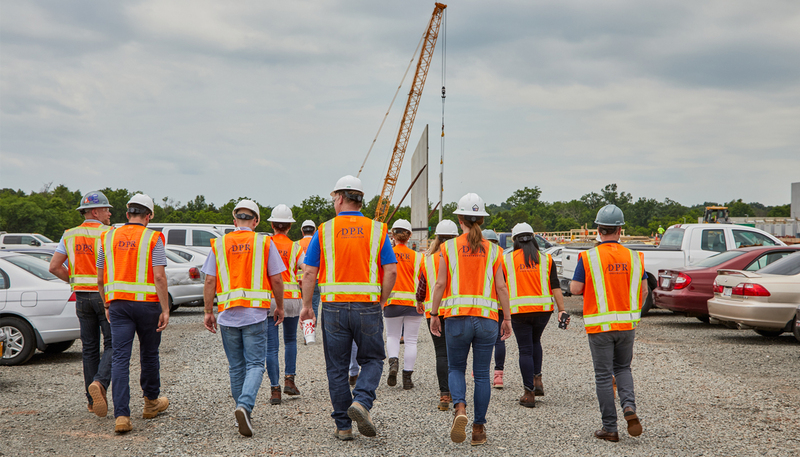 Like DPR, other client-serving companies are creating their own standards of certification, which can lead to an entirely different approach to build-outs and the overall business purpose of a project. Overall, both conversations captured new and upcoming trends seen across the country in the business and development of data centers. From fundamental project planning to advancements in technology, both panels influenced audiences by providing a variety of outlooks and experiences, as well as robust strategy. Status updates, comments, likes, photos, videos... they all require data and need to be accessible within just a few clicks, 24 hours a day, by Facebook's 1.65 billion monthly active users around the world. That calls for large quantities of data, strong processing power, and a lot of cooling. This is why the seaside town of Luleå, located on the edge of the Arctic Circle and considered Sweden's Silicon Valley, was a perfect location for Facebook to build one of its massive greenfield data center developments. At 300,000 sq. ft., Facebook's Luleå Data Center is one of the largest and most efficient data centers ever built. 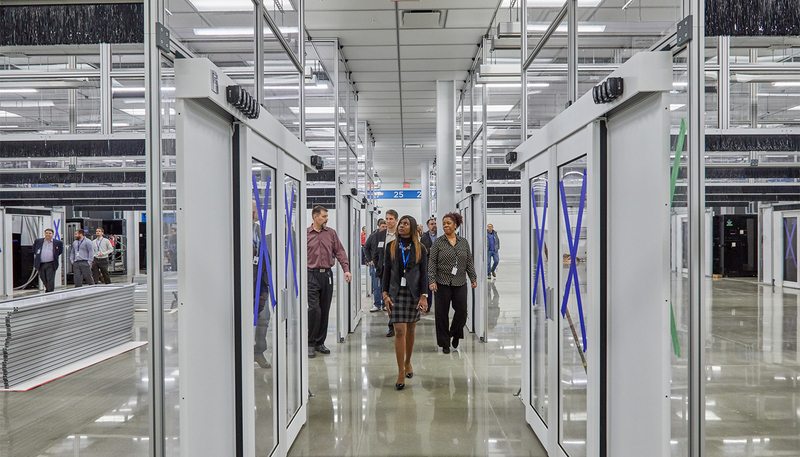 The data center, like Facebook's other facilities built by DPR in Oregon, North Carolina and Texas, features a super-efficient design that uses 100 percent outside air to cool the data center. This eliminates the need for power-hungry chillers to cool the tens of thousands of servers that run around the clock. Excess heat that is generated from the servers is pumped back into the building to keep the office space warm for employees. Power is provided locally by a reliable, 100 percent renewable energy source: hydroelectricity. Hydroelectricity is so reliable that Facebook has been able to eliminate the number of onsite backup generators by 70 percent. As part of Bloomberg's "Hello World" video series, in which journalist and best-selling author Ashlee Vance explores the tech scene in various countries, Ashlee finds out where "all [his] embarrassing photos live" while he takes a guided tour of the facility with Joel Kjellgren, Facebook's site manager. DPR completed building one of Facebook's Luleå development, aptly named "LLA1," in 17 months through a joint venture between NCC Construction Sweden and Fortis Construction in Portland, Oregon. LLA1 achieved LEED-NC Gold certification by the U.S. Green Building Council and received top honors with the "Innovation in the Mega Data Center" award at the Datacenter Dynamics EMEA Awards in 2014. When you think of Portland, you might think of coffeehouses or the infamous Pacific Northwest rain. But did you know Portland is also quickly becoming a technology hub with a flourishing economy and countless new opportunities for innovation? This very fact is one of the reasons LinkedIn has decided to build its newest data center in Hillsboro, a suburb just outside of Portland. With existing data center sites in Virginia and Texas, this new west-coast site will allow LinkedIn to achieve their goal of establishing data centers in varied regions across the United States. Additionally, this location enables LinkedIn to have direct access to green power. For 200 days out of the year the data center will utilize free cooling, reducing their overall energy usage. The location will also allow LinkedIn to explore new options for renewable energy and sustainable sourcing, leading to the company’s ultimate goal of 100 percent renewable energy usage. So why the need for another data center? In the last year, LinkedIn’s storage and processing needs have increased by 34 percent. Working to stay ahead of this rapidly growing demand, LinkedIn is adding more capacity in order to maintain the consistent and reliable service LinkedIn members are expecting. Construction of the data center will be completed in two phases. Phase 1, the build-out of data hall space for LinkedIn in an existing STACK INFRASTRUCTURE colocation facility, is comprised of 15,000 sq. ft. of white space and 3,000 sq. ft. of ancillary space. This will be DPR’s second time working in this facility, with the first time being in 2012 for Fortune Data Centers (now known as STACK INFRASTRUCTURE). Phase 2 is the construction of a new 100,000-sq.-ft. data center shell, 15,000 sq. ft. of which is confirmed for LinkedIn. Once both phases are complete, STACK INFRASTRUCTURE's entire facility will be served by 16 MW of IT Critical Power. Due to LinkedIn’s rapid growth and need for quick deployments, fast-track delivery is crucial for this design-build project. Even with the record-breaking amount of rainfall the area is experiencing, the project team remains confident in their scheduled completion dates. LinkedIn’s latest data center will go online late 2016. The LinkedIn Data Center Services team breaking ground on the new facility in Hillsboro, OR with the help of the STACK INFRASTRUCTURE team and the Mayor of Hillsboro. Almost 20 years after first entering the Richmond, Virginia market to build a semiconductor plant for Motorola and Siemens—a project that still ranks as one of the fastest-to-market facilities of its kind ever built—DPR is back at the same site. The current project? Repurposing and converting the former White Oak Semiconductor plant into a modern data center for Quality Technology Services (QTS). “I guess if you’re in the technical building industry long enough, you get to build great things twice,” said DPR's Mike White, who is managing the current QTS data center project and also managed the original White Oak project back in the 1990s. With a wealth of technical expertise, this project was a perfect fit for DPR to take on. However, that's not to say the project was without its challenges, including aggressive energy use goals and a focus on the maximum repurposing of existing assets. How did the project team tackle these challenges? Find out by reading the full story here. 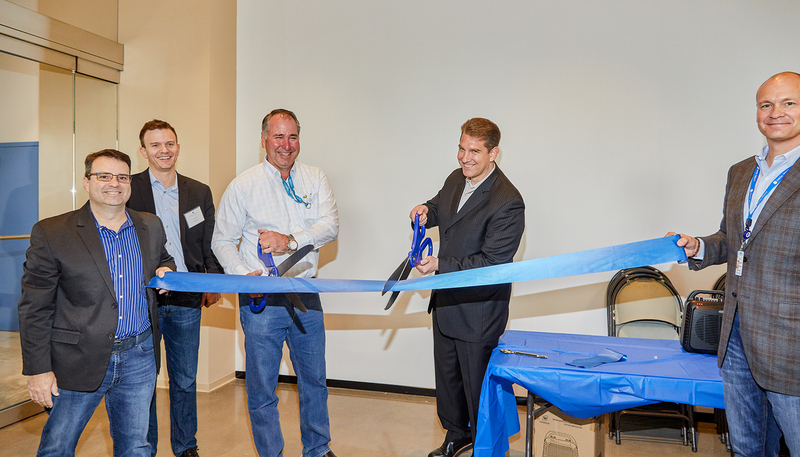 DPR’s longstanding relationship with Digital Realty (DLR), forged over the course of more than a decade and more than 150 successful data center projects across the U.S., laid the groundwork for DLR’s first time using integrated project delivery (IPD) on a data center project in Richardson, TX. By entering into a seven-party integrated form of agreement (IFOA), the IPD team shared all project risks and rewards on the $37.3 million, 140,000-sq.-ft. project. Like any challenging data center project, DLR's data center saw its fair share of challenges, such as schedule pressure due to intense rainfall, and the fact that this was the first IPD project that many of the firms involved had ever undertaken. However, the project was completed on the original 10-month schedule in July, approximately $500,000 under the original targeted value. The DLR data center came to be a true testament of what can be accomplished by a solution-oriented team backed by a high degree of trust, collaboration, and a shared commitment to finish on time and under budget. 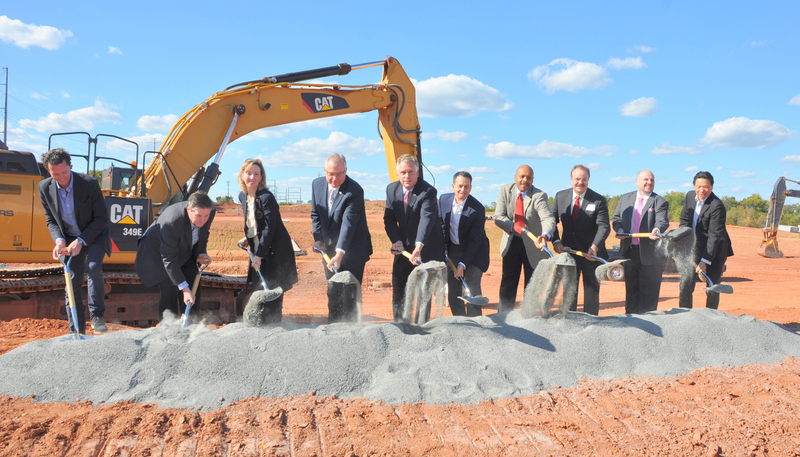 Since 1999, DPR has been part of the growing data center presence in Virginia and is continuing its role in the economic development of the county with its newest project, the Equinix Ashburn North campus, which broke ground October 15th. Virginia Governor Terry McAuliffe, Congresswoman Barbara Comstock (R-VA), Secretary of Commerce and Trade, Maurice Jones, and Buddy Rizer from Loudoun County’s Department of Economic Development were among the nearly 100 attendees at the jobsite’s groundbreaking ceremony. Comstock applauded Equinix and DPR for contributing to the growth of Loudoun County, noting that projects like Ashburn North help to bring more jobs to the area, contributing to the fact that Loudoun County is one of the best places to live in Virginia. 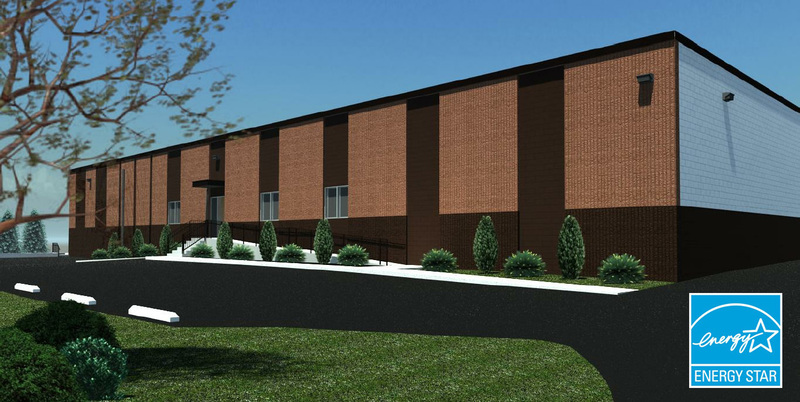 Rendering courtesy of Equinix, Inc. 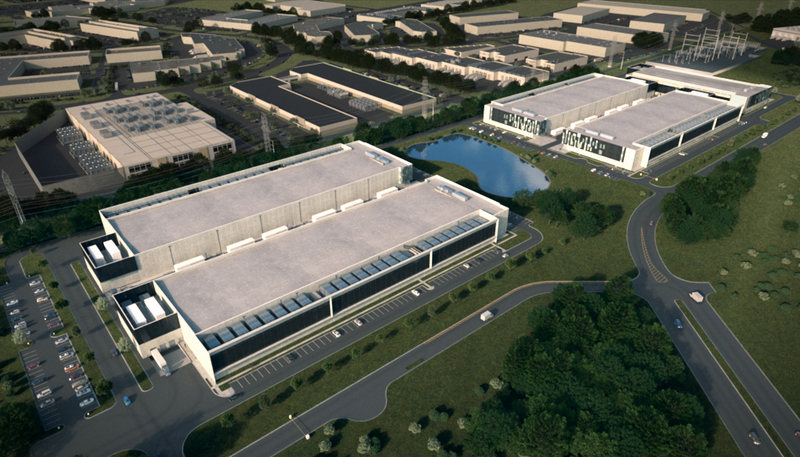 The 45-acre Equinix Ashburn North campus will add 1.2 million sq. 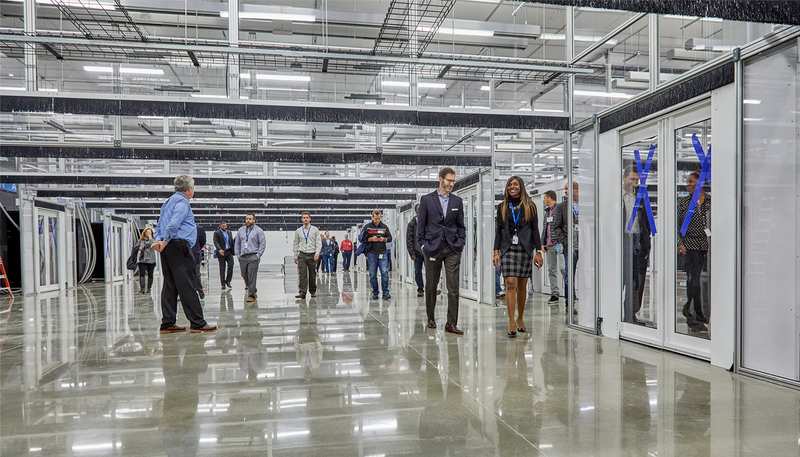 ft. of new data center space, contained within five new data centers, adding to Equinix’s existing stock of 10 data centers in the North Ashburn area. Major components of the early phases of the project include the mass earthwork, wet and dry utilities, paving and landscaping – set to be completed in early 2016.